AVC: Where did that notion come from? BF: The fun of it was, with this show, the notions of where we get the crazy ideas from come from such varied places and this one is a little bit of my [Pushing] Daisies background seeping through—but it was taking those Busby Berkeley images, those high-angle, “people mixed together creating this kaleidoscopic image,” but doing it with corpses. So Busby Berkeley was really the main inspiration for the human mural in a big way. In terms of the horror movie references that we have in the show, there’s a little bit of Jeepers Creepers, if you remember that first movie when they discover a bunch of bodies glued or sort of cocooned in the ceiling of the basement of a church. So that was also a standout image in my brain when I saw the movie. I was just like, “Oh, my God, that’s fantastic! I’ve never seen that before.” So combining that inspiration with my love of ’40s romantic comedies and musicals. It’s a strange hybrid. AVC: This case unfolds over two episodes. You’re being more playful with the “case of the week” structure this season. How did that develop? Was it just all the other balls you had in the air? BF: If you’re going to do a human mural, it felt like it was such a big, grand villain who would be doing this that it deserved to be two episodes. Also I feel like our first episode almost functions like the 14th episode of the first season, because there’s so much character work that we needed, and pipe [exposition and set-up] that we had to lay for where Alana is, where Jack is, where Hannibal is, where Beverly is. So, it really felt like in order to have our cake and eat it too, in order to really spend time with the characters and have those emotional moments, we had to spread the killer case over the two episodes, just to give us room to sink back into the season and not just hit the ground running and make it all about the plot. AVC: Do you think that Hannibal is enjoying consulting on these cases? BF: Absolutely. It’s an education on how not to get caught, so Hannibal is consulting on these cases with an eye for learning how the FBI does this, what are the things they track and trace, and how he can navigate around them to continue to be a free man. AVC: This episode heavily features Cynthia Nixon, who is such a great presence in anything she does. BF: I agree. I think she has such fantastic energy, and it was so fun to be in the editing room with Cynthia, because she brings a different flavor to the show. Her presence, Raúl Esparza’s presence—it’s fun to get these guest stars who really shake up the world and give us a different energy and a different note to play. AVC: Where did that character come from, and how did you land on her to play it? BF: Kade Purnell is an anagram of a character from Hannibal, actually the Ray Liotta character. So it’s like, “Your anagrams are showing, Dr. Lecter.” We couldn’t get the rights to that character, because that character originated in Silence Of The Lambs. The character’s name was Paul Krendler, and we wanted to call her Paula Krendler, and they said no, because the way the rights go, it’s not by the literature, it’s actually by the character’s introduction. So if a character is first seen in Silence Of The Lambs, we’re screwed, as far as rights go. In order to change the character so it’s not that but sort of services the same mythology in the show and reinvent the character in a way that won’t get us sued, [Laughs.] we anagrammed her and made her slightly different from the character in both Silence Of The Lambs and Hannibal to our own purposes. Having her come in as Jack’s boss, questioning what the hell happened in season one, felt like we needed that role. We needed that reality check-in of a structure inside the FBI that polices its own, and so we have her in the first three episodes, and then she comes back into play toward the end of the season. AVC: Does having the rights to everything but Silence Of The Lambs still come up a fair amount, and do you have hopes that that will be resolved in your favor? BF: I would love for it to be, because I think it would be great if this show became canonical. I would love it for that reason, and we would absolutely go back to MGM and try to figure that out. But I think in order to get there, Gaumont, the studio that owns Hannibal, would have to come to some agreement with MGM that was mutually beneficial for both studios in order for us to have that happen. I’m going to keep trying. BF: I think he needed it, because there was so much despair, and everybody was just assuming he was guilty of all of these crimes. I think he needed someone to say simply, “I believe you.” When I was writing that scene I teared up, because something so simple as someone saying, “I understand you, and I believe you,” when you’re in a dark, lonely place is such a beacon of hope. I love Gillian Anderson as a human being and as an actress. And I love Hugh Dancy as a human being and as an actor, so I was excited to get them in a scene together, especially one that was so still and eerie and wrought. 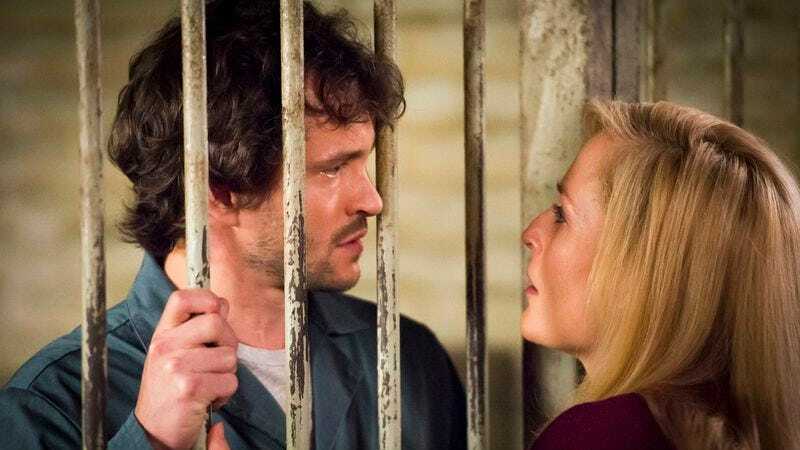 I’ve always been inspired by this line from Damaged that Juliette Binoche says, which is, “Damaged people are dangerous, because they know they can survive,” and I paraphrased that in the last scene with Dr. Du Maurier and Will Graham, where there is a camaraderie in the damaged. You may feel you are alone in your damage, because it is such an interior experience to be damaged in that way, and then to have somebody come along who you know can know you in that way, it’s a beautiful thing. It’s a glimmer of hope. So I was really excited about that moment, writing it, and even more excited when I saw the actors perform it, because I do think that there is a bond between Will and Bedelia that I hope we get to explore. AVC: If there’s a character in season one who felt a little underserved sometimes, it was Alana, but now she seems to have much more of a role in things. What did you want to do with her in season two? BF: Caroline Dhavernas is such an interesting actress and has this grounded quality to her and a soulful quality to her. With Alana Bloom, her conflict with Will is she cares deeply for him, but recognizes that he is off his rocker, and therefore as a responsible adult can’t engage. But she’s always going to have that want. She desperately wants to help Will Graham and she desperately wants to fix him, which is why she can’t be romantically involved with him, because that’s an unhealthy way to enter into a relationship, with the agenda of fixing someone. AVC: You talk a lot in this episode and this show about God and the notion of God as ultimate killer. What do you see as God’s place within the universe of this show? BF: There’s a couple places for it. There’s the place of, Hannibal Lecter is Satan, and this is all playing out in a parable of the darkest angel’s seduction of the purest man. There’s that angle, so whenever Hannibal is talking about God, there’s one sense that is he’s speaking about it almost in a mocking sense to anybody who would deign to be so superstitious as to believe in a higher power. On the other sense, which I think is sort of the Hannibal from the literature is constantly bringing that up and the villainy of God, that he is worshipped, yet he will drop churches on congregations to what end? There’s a wicked sense of humor there. I think in our mythology for this show, in that first meeting with Mads Mikkelsen, when he was talking about how he wants to play Hannibal as Lucifer, the fallen angel, that stuck with me in such a resonant way, because I was raised Catholic, and I love all of the mythology, which I view as more science fiction than spiritual. But that doesn’t stop me from enjoying the richness of the storytelling, and so I get excited about that prospect, that we are literally talking about the devil. And we don’t necessarily have to address it or confirm it in any way, shape, or form, but I love the question of, “Is he actually the devil, or is he just a really bad man?” [Laughs.] But I think if he is the devil, it’s cool, as long as we don’t make it too real. Come back next Saturday for discussion of episode three.